Lovely woman writer seeks attractive lover (48-68) with soul of Leonard Cohen, mind of Sartre and charisma of Obama. Near offers considered! Stop making eyes at me and I’ll stop making eyes at you. This packed fish tin of a train simply cannot handle two lust-infused singletons communicating via ocular Morse code. I’ve noticed you reading the LRB and this is the opening gambit to our love game. Male (42) with acute blepharospasm. Wacky raconteuse (73) seeks London based dark horse (M) for conversational and/or other ventures. Yoof seeks Youfette willing to perambulate the South Bank talking about her favourite book. If life is like a box of chocolates, I’m the wrapper: clingy, transparent, and willingly stripped and screwed. Lactose intolerant F (24) seeks M 24-33 (no dentists) for sweet encounters. 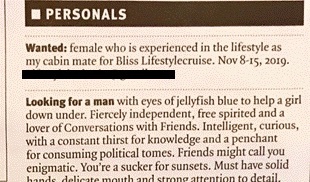 Women, 45, seeks Jungian-oriented man, 40-55, who is having, or has had, a fruitful analysis. Eccentric young gentlemen seek pretentious book lover. Ideally London based, with a liking for vegetables, GoT and small children. Preferably 25-32. Thoughtful, attractive woman, 53, seeks riddle-solving man, 45-55. If you can tell me what links African sunsets, birdsong, swimming in warm seas, lily of the valley & dark chocolate – maybe we should share them. Previous Previous post: Do You Understand English?! Next Next post: 3 Big Structural Forces To Watch: Tech Cold War, Diesel Car Collapse, Liquidity Illusion.